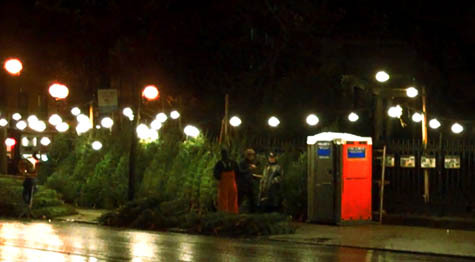 [Image: Christmas trees for sale outside St. Mark's Church in New York City; a video-still taken November 30th, 2009]. "The most surreal part of Christmas," architect and blogger Sam Jacob wrote two years ago, "is the migratory forest that pops up all around us for three weeks." It's an image that has stuck with me: Christmas and its ubiquitous tree treated as a kind of vernacular landscape practice—or folk forestry—more than a religious event with Rapturous implications. "Perhaps Christmas trees are a ghostly return of the mysterious ancient forest," Jacob suggests, "a rolling back of the mechanisms and constructs of civilisation that addresses the Big Bad Wolf or Little Red Riding Hood inside us all." See Mitch Duneier's "Sidewalk" for an interesting look into the lives of the tree vendors in New York City.